Eagles, Eiseley, Ed and time « Hercules and the umpire. My former law partner Ed, surely one of the best human beings ever, has a farm adjacent to the J-2 return to the Platte river from the small hydroelectric power plant near Lexington, Nebraska. It is a section of ground (640 acres) that borders the river and the return to the river from the power plant. It is some of the best agricultural land in the world. Ed keeps the portion of the land near the river pristine. It is a magical place. I used to take the children there to watch wild life particularly the bald eagle. Eagles gather there all year. In the winter, the eagles are there in abundance particularly because the irrigation canal downstream of the power generating station and the river itself remain open as a result of warm water leaving the power plant. Some of you may know of my love of Loren Eiseley’s work. Born in Lincoln, Nebraska, and first educated at the University of Nebraska where he received degrees in both English and Anthropology, Loren Eiseley (September 3, 1907 – July 9, 1977) was a world-renowned anthropologist and a writer of unsurpassed talent. He taught and published essays, poetry and books from the 1940s through the 1970s. See my earlier post entitled All the strange connections and the classics. Eiseley was fascinated with time and the relationship of time to our physical world and our place therein. I was reminded of Eiseley, my partner Ed, my children and the passage of time when I viewed the following photo of bald eagles near Ed’s place taken just two weeks ago. The image took my breath away and instantly transported me back in time. Photo credit: Lori Potter. National Federation of Press Women President Lori Potter has been a staff writer, photographer and columnist for a small daily newspaper in south-central Nebraska, the Kearney Hub, for more than 25 years. See potterspix. You’ve often mentioned that you tend to perceive meaningful connections in unrelated events. I learned recently that there is a word for that gift: Apophenia. 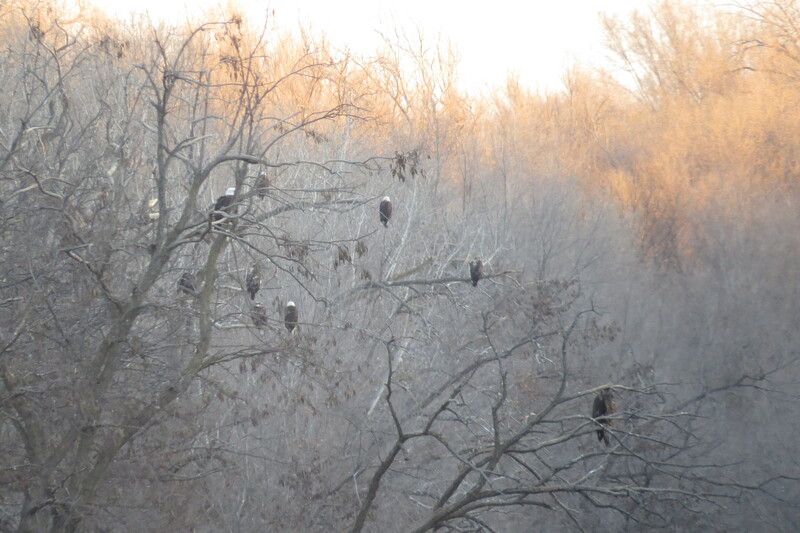 I suspect that our gathering of judges in Omaha yesterday brought to your mind the gathering of eagles. After all, we’re a stoic and majestic lot, and more than one of us is bald . . . . I found Eisely’s “All the Strange Hours” one of the most inspiring and touching biographies I’ve ever read. Thanks for reminding me of it. Indeed. Virtually everything he wrote was inspiring and touching. I, too, loved “All the Strange Hours.” All the best. My penchant for legal realism requires that I remind you that bald eagles, particularly along the Platte river which is adjacent to I-80, are carrion eaters. Judge, thanks for posting the picture. I know from growing up in Montana there’s a special quality about a river in the stillness of winter. The photo looks like Haines, Alaska. I recently read a fascinating article about how bald eagles made a comeback in New Jersey. I have to assume that the elements are much more favorable in Nebraska for bald eagles. The photo is so striking. Pingback: Apophenia « Hercules and the umpire.